A green and soft Seacroft Golf Club awaited us following days of heavy rain. For those that have played in and attended this event in the past, the course looked and played very differently to years gone by! Our team was mixed with experience and youth, with Luis WItherall being called into the squad late into the week, following Mikey Chambers gaining a spot in the Welsh Strokeplay, with the other end of the age spectrum coming from Fraser Carnihan and Chris White. Our weekend started on Saturday morning, after a few holes practise Friday evening, with matches against Norfolk and Suffolk – for those that don’t know this event, the players play a triangular series of events, with matches being played simultaneously against both opposition. So there is a need for constant concentration from the players, not only on the shots but also the match scores! Our 10 man team lined up on Saturday morning with the following pairings, Sam Henfrey & Liam McNeela, Jack Hall & Tom Burgh, Fraser Carnihan & Chris White, Charlie Salter & Luis Witherall and finally Miles Mudge & Ryan Connolly. A team with 6 debutants at this event. Sam and Liam managed to gain a win against Suffolk opposition on Saturday morning, but lost to a Norfolk pair containing England international Toby Briggs. The only other winners of the morning session were the experienced pair of Carnihan & White, managing to maintain an early advantage against Suffolk opposition. This was a baptism of fire for our boys, losing all 5 points against Norfolk, a team we had beaten in the Anglian League match just 2 weeks earlier. So a disappointing morning, gaining only 2 of a possible 10 points, saw us close to but not bottom of the 9 team league table at lunchtime. Bedfordshire with the best finish possible, with the 4th hole (our 17th having started at 6), playing into a strong breeze, Chris White struck a magnificent 3 iron to 15 feet and Fraser calmly rolled in the putt to take a one up advantage to the 5th (18th). This hole played as a virtual par 5 all weekend, with very few teams able to reach in two, a very tidy 9 iron pitch from 30 yards short from Fraser, enabled Chris to nudge in a 3 footer to win their 2nd match of the day. In match 5, Ryan Connolly and Miles Mudge performed some of the quality of golf they are both capable of to dispose of the Bedfordshire pair – with some very solid golf in increasingly tricky conditions. So an afternoon collection of 4.5 points was an improvement on the morning, most of these points gained against Bedfordshire. Essex ended day one on a total of 16 points from possible 20 – we had just been beaten by the team that would run away with the trophy! A creditable performance, but we all felt that there was more to come from each other. 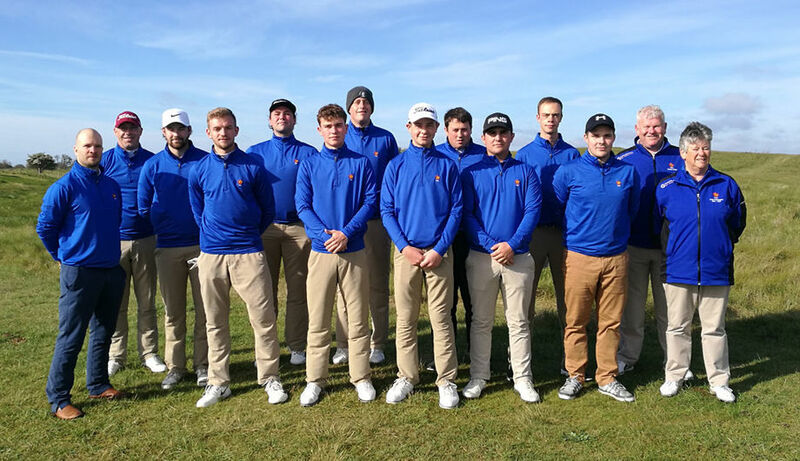 Sunday morning’s opposition came in the form of Leicestershire and Cambridgeshire – the weather was much more enjoyable for the players (and those watching), bright sunshine, but the strong Southerly breeze persisted to make holes 1 to 9 very tough. Starting our day, again from the 6th tee, the Captain saw no need to change the order, feeling like some momentum had been gathered on Saturday afternoon. One of the highlights of the weekend came on Sunday morning, as the youthful team of Charlie Salter and Luis Witherall, having gathered experience the previous day found their stride and dismantled both opponents by the tune of 4&3, thanks mainly to a run of 4 consecutive birdies from the 13th. Playing against the Cambridgeshire captain, who would later speak extremely highly of the two young, Northamptonshire boys. Unfortunately these two points were only added to by Sam Henfrey and Liam McNeela again out top. This left us in grave danger of taking the wooden spoon home, something none of us wanted and something that was regularly highlighted among the group! On Sunday afternoon we were up against Lincolnshire and BBO. Again some slight order changes to freshen things up, this meant pressure on the young guns of Salter & Witherall, who conducted themselves as they had all weekend, very well. But in this group they came up against Lincs and BBO’s most experienced pairings and nothing went Northants way. Early finishes in both matches for the boys, but a weekend to be proud of and a lot of experience gained. Liam & Sam enjoying themselves out of the top spot, showed their true class and potential running out 6&5 winners against Lincs and 5&3 winners against BBO. Chris & Fraser again won one of their two matches, with Chris beginning to struggle with the effects of a long standing foot injury – this weekend challenges you in ways you can only imagine unless you have played! Tom & Jack by this stage were really up against it and running out of form…..losing both matches much earlier than they would have wanted, but again, specifically for Jack a lot of experience has been gained to be taken on to future matches for the county and his club. This left Ryan & Miles on the course, playing the penultimate hole of the weekend, the par 5 9th at Seacroft, dormie 2 up in both matches. After a fine drive, into the wind from Miles, Ryan played the shot of the weekend, a 3 wood to within inches of the flag tucked tightly up against the front bunker. A fabulous end to a hard working weekend, followed shortly after that our 5 points in the final session, was enough, JUST, to avoid the wooden spoon. Suffolk will defend that next year! So not the overall result we would have obviously hoped for, but the future of the county is very good. Some excellent performances, with maybe a lack of consistency. But playing against some of the finest players in the region! Thanks from the Captain go to County Coach Shane Rose for his attendance and help with the players, Team Manager Mike Gilbrook for his impeccable organisation across the whole weekend, County Vice President Carol Gibbs and husband Rod, John Pearson (also in charge of the referees for the weekend and finally to Andy Nicholettos of Prevail for his work with the players on fitness for the weekend and any physio requirements. And to the players, for their impeccable behaviour, 100% commitment to the cause and the tenacity, desire and diligence to the team we spoke about on Friday evening! Northamptonshire Golf is in good order and has a good future ahead of us. The next fixture takes us back to Anglian League duty, with a match on the 4th of June against Lincolnshire at Wellingborough Golf Club.